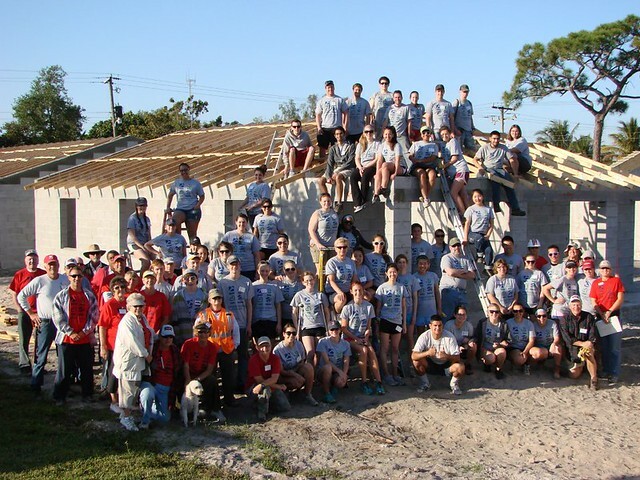 The homes of which the last Collegiate Challenge team worked on in Miramar, Florida are being dedicated today, October 19th! Collegiate Challenge is a week long event that occurs over our Spring Break. About 20 students travel to another Habitat affiliate where they spend the week working with a them. The Franklin, Louima, Murray, and Torres families are very excited to get the keys to their new Habitat Broward homes at their Miramar Home Dedication on Saturday, October 19 at 2 PM! Home sponsors: American Express, BBi, Publix, First Presbyterian Church and Sunbeam/ WSVN invite you to join the celebration. The dedication will be held at 6150 SW 25th Street, Miramar. They're dedicating their 350th Habitat Broward home in 30 years! Thanks to everybody who came to events last week! We had a handful of support from students signing the World Habitat Day pledge during World Habitat Day and the inaugural Feast for Humanity was a success! Thanks for coming!